The mobile workforce faces a challenge. Smartphones and tablets work fine for most business purposes, but handheld devices with tiny microphones and speakers are not ideal for audio and video conferencing. Logitech is seeking to remedy that with the new P710e mobile speakerphone. 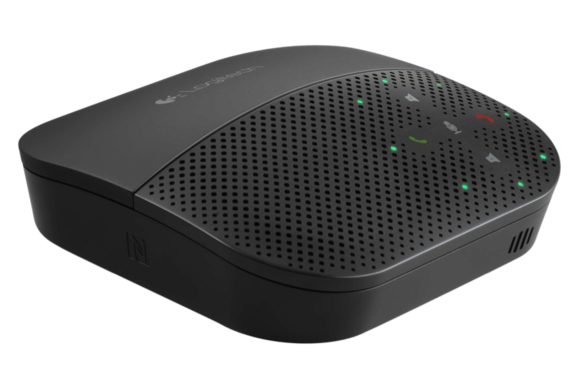 Logitech designed the P710e to enable mobile workers to engage in audio and video conference sessions as if they were sitting at their office desk or in the conference room. The speakerphone provides hands-free operation with optimal positioning for a mobile device, so the display is at a good viewing angle and the forward-facing camera is focused on your face. The Logitech P710e lets you take enterprise-class audio and video conferencing anywhere you go. The P710e microphone is equipped with both acoustic echo cancelation and noise-canceling technologies, and it uses digital signal processing and wideband technologies to enhance audio quality. It's Skype certified, Cisco compatible, and optimized for Microsoft Lync. The speakerphone lasts for up to 15 hours on a single charge and connects to your smartphone and/or tablet via USB, Bluetooth, or NFC. It can pair with up to eight Bluetooth devices so you don’t have to jump through hoops to connect it with different devices as your needs change. Logitech isn’t trying to compete with portable Bluetooth sound systems like the Jawbone Jambox, or the Bose Soundlink Mini. Those devices are engineered specifically for music fidelity, and both do an excellent job at delivering superior sound quality. Logitech’s focus is on enterprise-quality audio geared specifically for business conferencing. I still wouldn’t recommend setting up shop in the middle of Starbucks with your iPad and a Logitech P710e. Neither other patrons nor your company would appreciate you broadcasting your meeting. But, the P710e could come in handy for use from a home office or during business travel when you can use it from a hotel room or other more private, quiet space. The Logitech P710e costs $170 from the Logitech website, and it’s available now.